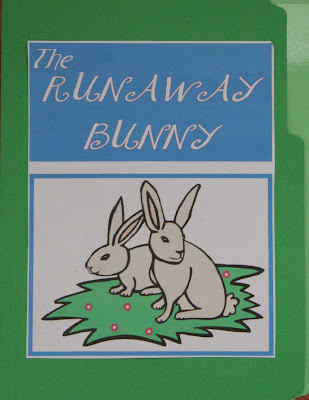 This week I'll be sharing about our preschool fun studying the letter "R" and the lapbook for Runaway Bunny that I created to go along with the book. At the end of the post you will find Mr. Linky so that you can participate too in the fun by sharing what you've been doing during your preschool time. Rick had a business trip this week and I was able to tag along for a few days, so I spent some of my alone time during the day sketching out the lapbook pieces and putting them together for us to do. I based most of the minit books on the areas that Before Five in a Row covers. All of the pieces I made are now posted at Homeschool Share and Ami was great to make the cover (which I forgot) and also a few bonus games to go along with it. We did do a few activities that weren't related to the book, but it's all listed below, so enjoy looking around. I've provided links to the various activities and sites that we used whenever possible. Of course now that I'm posting, I'm thinking of a bunch of other little minit books that I could have made too ~ sigh. Zachary had a lot of fun with this activity...and then Kaleb joined in and the REAL fun began. 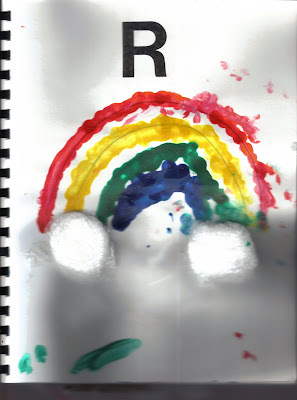 He practiced his uppercase and lowercase 'R's' and also made rectangles. Homeschool Share has a fun game that uses images of rabbits with long ears, short ears, etc...and then has a shadow image of it to match. We stored our game pieces in a pocket on the back of the lapbook. 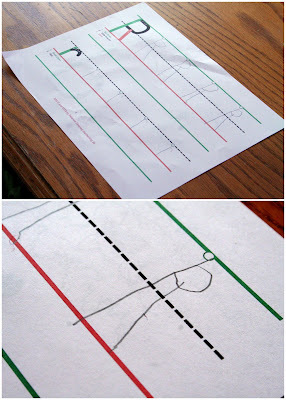 You can find the shadow match and patterning games here. 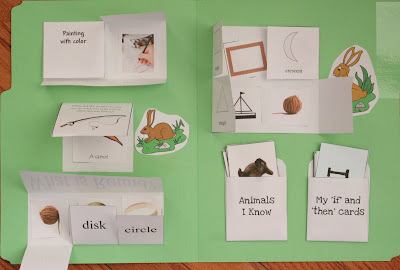 The lapbook pieces that I created can be found at Homeschool Share. Here are the links for the lapbook cover and some other games to go along with the lapbook. I used a full size folder for this lapbook and glued some of the game pieces directly onto the folder so that we could open it up and play it. On the back of the lapbook I glued our math game (only three sides) so that the pieces to the game can slide down in between the game board and the lapbook cover. You can see it in one of the pictures below if you can't visualize it. What is Round? 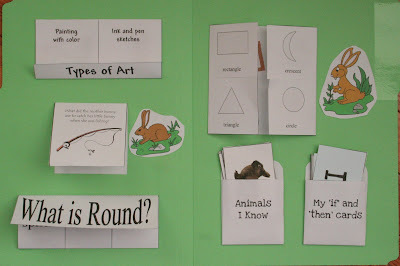 We looked throughout the book for different things that are round (spheres, disks, circles). Animal identification and matching ~ There were several different animals in the story at some point: bird, rabbit, monkey, donkey, kangaroo, fish, dog and donkey. 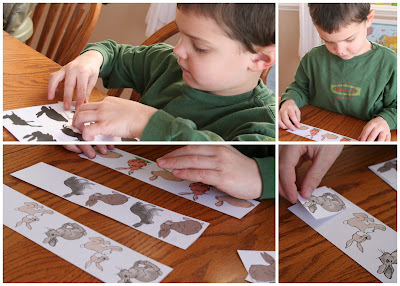 There are two sets of cards to use either as a matching game or as animal id cards. 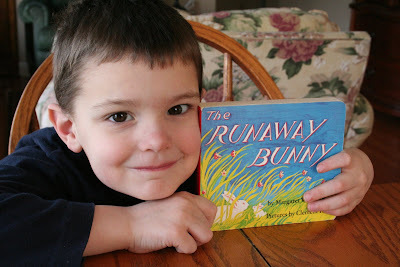 If/Then ~ Throughout the book the little bunny says he will become different things and his mother then says she will be something to find him (if you are a rock then I will become a mountain climber). There are cards for each of the If/Then's in the book. Shapes throughout the book ~ This minit book has four different shapes: square, crescent, circle and triangle. 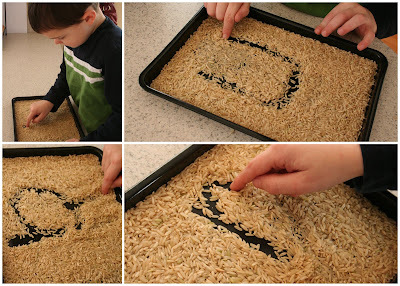 I pulled out a bag of rice and poured it into a shallow baking pan so we could 'trace' letters and shapes in the rice. We also had fun with our geo boards making rectangle shapes with rubber bands. "Remember the Sabbath day to keep it holy." I loved reading this! Your lapbook looks great. You gave a very good explantion/description of the minut books (what does minut mean, btw?). My post is about my 3 younger children this week, 2nd grader, pre-K and "baby", but I wanted to share it because that's how we school around here - doing a lot of things together!